Sinigang with guava’s as compared to sinigang with tamarind are on lighter and sweeter side than being acidic.That is why most people prefer guava sinigang. When cooking this type of sinigang remember to choose guavas that are well riped as it is easy to get the juice out of them. You have the option to leave the guava pulp or not with the soup. In our family we love to eat guava sinigang paired with sauteed shrimp paste (ginisang bagoong). 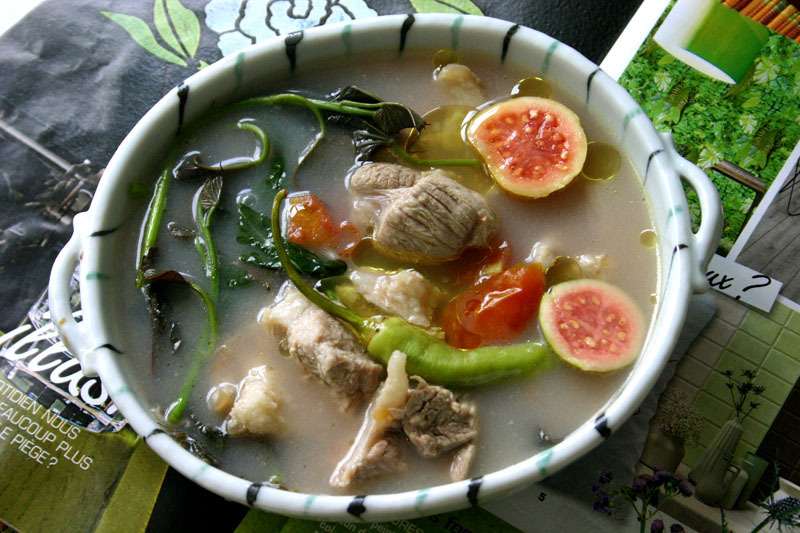 This guava soup recipe is very versatile as you can replace the pork with beef or bangus (milkfish ) as you prefer. * Please note that you can use other vegetables on this soup dish like: sitao (string beans, eggplant, okra (gumbo), etc. In a big cooking pot pour about a liter of water or hugas bigas then add your quartered onion and tomatoes. Turn on the fire and let it boil. While waiting for the water to boil, was the guavas and cut them in halves. Scoop out the seeds and set them aside. As soon as the water boil add your halves guavas and pork then cover the pot. After about ten minutes take one by one the guavas from the pot, they should be soft and tender. Lower the fire and let the soup continue cooking with the pork. In a bowl mash the cooked guava using a fork, add the pulp and pour a laddle of hot water from your boiling soup continue mashing to get the juice out of it. The hot water will help you extract the juice from your guava. Pour the guava juice directly on to your cooking soup use a strainer to separate the seeds and the pulp. Then get a clean cheesecloth put the pulp and seeds then squeeze thoroughly until the last drop of juice is taken out from the mashed guava pulp and seeds. Pour this on to your boiling soup. Cover and continue boiling until the pork is tender probably about thirty minutes. On the last minute add all the vegetables and cook for about ten more minutes, put a teaspoon ofsalt and 2 tablespoons of fish sauce (patis) to taste. Cut the fire and let the vegetables be cooked on the hot soup. Serve hot in big bowls with steamed rice and sauteed bagoong.